Robots are awesome, argues comedian Whit Nelson — and who are we to disagree with him? Despite their awesomeness, we still worry about them taking over the world. On August 5th, 2012, less than a month from now, a spacecraft will descend from the sky and using a series of jets, it will hover over the planet&apos;s surface. It will then use a sort of sky-crane to lower a robot by cables down to the ground. The parent craft will power up and fly away. 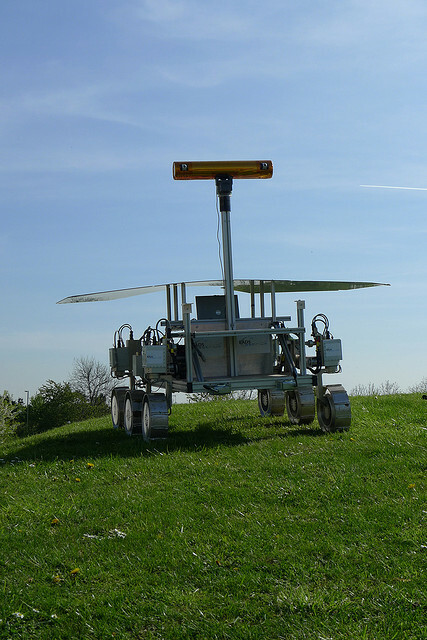 The landing vehicle will be a six-wheeled robot the size of of MINI Cooper. It will be smart enough to navigate and explore by itself. It will be nuclear powered. It will have lasers that shoot out of its eyes. Yes, those kind of lasers, for blasting things. Thankfully, this Orwellian nightmare will be landing on the surface of Mars, the latest in a series of missions in which NASA telecommutes to the Red Planet. Having long ago outsourced exploration to robots, NASA now spends millions of dollars making them larger, packing them with plutonium and arming them. And they aren&apos;t the only ones. Robotic advancement has accelerated in the last three decade, reaching into our homes and workplaces. Robots now roam our houses cleaning up after us, moving supplies around warehouses and hospitals and thanks to Google and the Nevada Department of Motor Vehicles, they even drive on our highways. And why shouldn&apos;t they? I tell you why they shouldn&apos;t. EVERY SCIFI MOVIE EVER. There is a theory in anthropology that says humanity uses use film and literature in the same way that it’s said our dreams are supposed to work. We run simulations, we see if we like the outcome, and change our behavior to steer away from bad outcomes or into good ones. For example, in the film The 6th Day with Arnold Schwarzenegger, we saw that cloning human beings resulted in two Arnold Schwarzenegger&apos;s, so we banned human cloning. We worry about the consequences of our actions, and we move to steer human progress. In nearly every other field of study we seem to be we build legal and moral boundaries around this kind of progress. We don&apos;t just engineer new viruses all willy-nilly. But for some reason, we behave completely different when it comes to Artificial Intelligence. Nearly every movie about Artificial Intelligence either begins or ends with the robots becoming self-aware, which most of the time includes lots and lots of homicide.